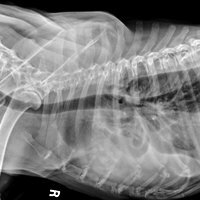 Alan Lipman, DVM, DACVR, examines thoracic radiographs and explains his diagnosis. A 7 year old neutered male mixed breed dog presented to DoveLewis Emergency Animal Hospital for lethargy, anorexia and respiratory distress. Physical examination revealed left sided pulmonary crackles and generally harsh lung sounds bilaterally. No evidence of a heart murmur was present and the patient was afebrile. 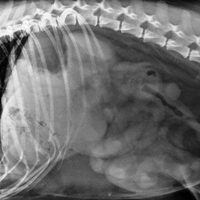 Two view thoracic radiographs were made and are included. What abnormalities are present, and what differentials should be considered? There are visible pleural fissure lines bilaterally as well as rounding and retraction of both lungs from the body wall on the ventrodorsal projection. There is moderate alveolar infiltrate involving the left lung (predominately cranially), as well as the right cranial lung lobe. The cardiac silhouette does appear mildly enlarged, however evaluation of the heart is slightly limited due to superimposition of pleural effusion and pulmonary infiltrate. Pulmonary vasculature is not distended. The liver is at the high end of normal in size with no evidence of peritoneal effusion. There are many diagnoses to consider with a combination of pulmonary infiltrate and pleural effusion, the most likely of which are cardiogenic pulmonary edema, lung lobe torsion, pulmonary hemorrhage (either traumatic or secondary to coagulopathy) and diffuse neoplastic infiltration. Pulmonary infiltrates seen with heart failure usually involve the caudal lung lobes (often initially right-sided). Lung lobe torsions often involve the cranial lung lobes, however the affected lung lobe typically appears enlarged with a mediastinal shift. The infiltrate identified with this patient involved multiple lung lobes and no evidence of mediastinal shift was identified which made this diagnosis very unlikely. Aspiration/bacterial pneumonia although common, does not usually present with effusion. Upon further questioning, the owner revealed the presence of anticoagulant rodenticide in the environment. Coagulation times were elevated, and a diagnosis of rodenticide toxicity was made. 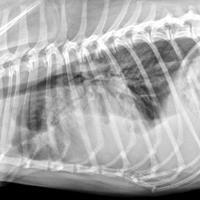 Pulmonary hemorrhage subsequent to rodenticide toxicity should be considered in the presence of either diffuse alveolar infiltrate or pleural effusion, but with a higher index of suspicion when both patterns are present concurrently.